The Great East Japan Earthquake of March, 2011 struck extremely vast areas while there was only about 3 hour left until sunset. Both factors impeded information gathering by helicopters, and information gathering and judgment took much time. Smooth rescue activities as an initial response were not possible in some areas. Rescue operations within 72 hours after a natural disaster are by far the most important in the event of a disaster. Because the functions of ground transportation networks have diminished capacities during this period, effective use of aeronautical and space equipment is of the utmost importance for optimal operation of disaster relief aircraft. 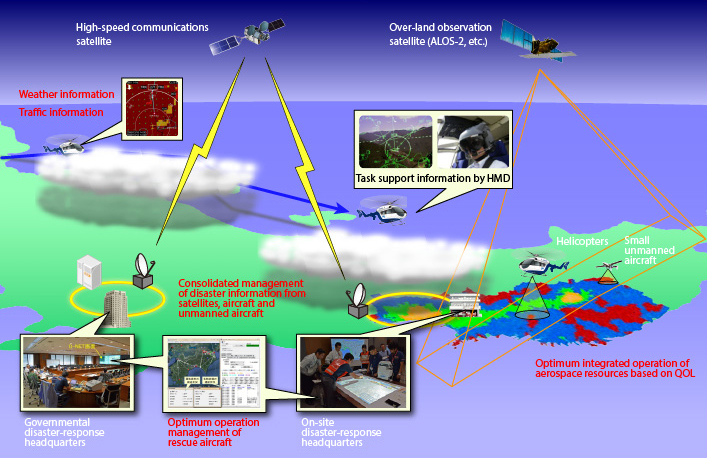 JAXA supports enhanced provision for an eventual large-scale disaster by developing the necessary technologies to implement "Integrated aircraft operation system for disaster relief (D-NET2)", which assists collection and sharing of disaster information through the integrated operation of aircraft such as helicopters, unmanned aerial vehicles (UAVs), and satellites, for efficient and safe rescue operations by disaster relief aircraft. 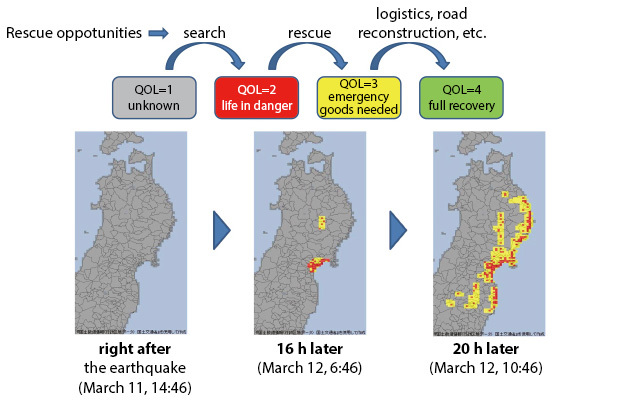 So as to quantitatively validate the performance of D-NET2, JAXA is considering using quality of life (QOL) indices to numerically visualize the progress of relief operations in each region. The real time integration, organization, and periodical updating of information obtained from aerospace equipment and other sources, such as weather information and hospital information, can minimize regional gaps in relief operations. Revisions of the damage estimation and countermeasures for large-scale wide-area disasters are underway, with Japan’s Cabinet Office playing a central role. Based on these revisions, and considering the first 72 hours after a disaster being critical, JAXA has defined D-NET2’s performance goal as “a 66% reduction in the areas with QOL2 and under”. In other words, utilizing aerospace equipment in direct search and rescue operations will reduce by 66% in the areas where human life is still endangered, even 72 hours after the disaster. To achieve this objective, JAXA will continue to promote further research and development in essential aeronautical and space technologies, collaborate with other fields, and cooperate with disaster-response agencies. The “Disaster Relief Aircraft Information Sharing Network” (D-NET) for research and development, and as part of the DREAMS project, has facilitated the integration of information among disaster relief helicopters, medical rescue helicopters, aircraft operation centers, disaster-relief headquarters, ground rescuers, unmanned aircraft, and other disaster relief systems. The further sharing of disaster relief information obtained from earth observation satellites such as Advanced Land Observing Satellite-2 "DAICHI-2" (ALOS-2), and from unmanned aircraft such as long-endurance unmanned aerial vehicles, can enable more efficient disaster relief operations and timely rescue. D-NET assigns the optimal mission to each aircraft based on local and definite disaster information, helicopters' specifications, weather conditions, etc. This has reduced waiting times for refueling or mission assignments. We intend to gather and provide broad-based and indefinite disaster information observed by satellites, and to re-configure the algorithm for supporting the planning of optimal flight schedule of disaster relief aircraft. D-NET accommodates Doctor-Helis, and allows sharing of a patient's vital information between the prospective receiving hospital and the Doctor-Heli. We seek to establish an information application technology, including possible application of relief identification signs by satellites, to rescue large numbers of critically ill or injured during large-scale disasters by such measures as using more strategic judgment (triage) . Mid-air collision has become avoidable by sharing aerial positional information of each aircraft, and collision of aircraft with ground obstructions, such as transmission lines and steel towers, can be prevented by sharing a cartographic database. Sharing information related to obstructions detected by aircraft enables us to comprehend the situation of more up-to-date obstructions, which engenders enhanced collision prevention. FLIGHT PATH No.7/8 "D-NET2: Integrated Aircraft Operation System for Disaster Relief"